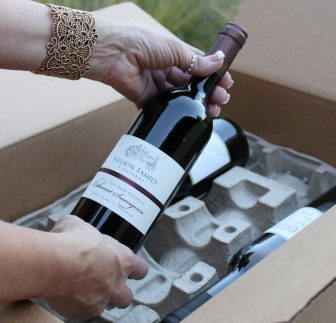 Customize your twelve bottle wine club selection that will be shipped twice per year! Click Here to see the options. Customize your four bottle wine club selection that will be shipped twice per year! Click Here to see the options. Customize your six bottle wine club selection that will be shipped twice per year! Click Here to see the options. This winning blend of Zinfandel, Cabernet Sauvignon, Petit Verdot, and Petite Sirah has a palate bursting of dark fruit with hints of vanilla and caramel. Fermented in open top tanks and aged in French Oak for 10 months. Flavors of cherry and raspberry with hints of spice! This is a perfect holiday wine. Full bodied Zin with aromas of blackberries, boysenberries and notes of pepper and spice. With supple tannins, this wine is sure to please even the most discerning palate. Enticing aromas of black currant, cassis, and cloves. Full palate of dark fruit, spice and toasted oak. A beautifully well-balanced wine with a gorgeous finish.